I have realized that this designer cannot go wrong. She just has a lovely eye for lace patterns. 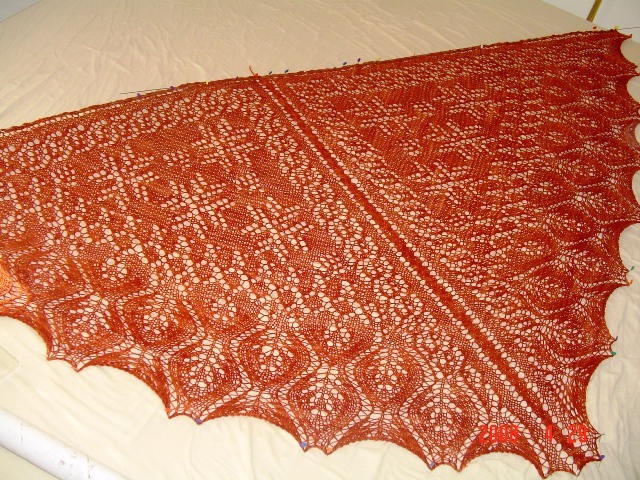 This shawl is stunning! I finished the bind off last evening and blocked it over night. I am wearing it today! 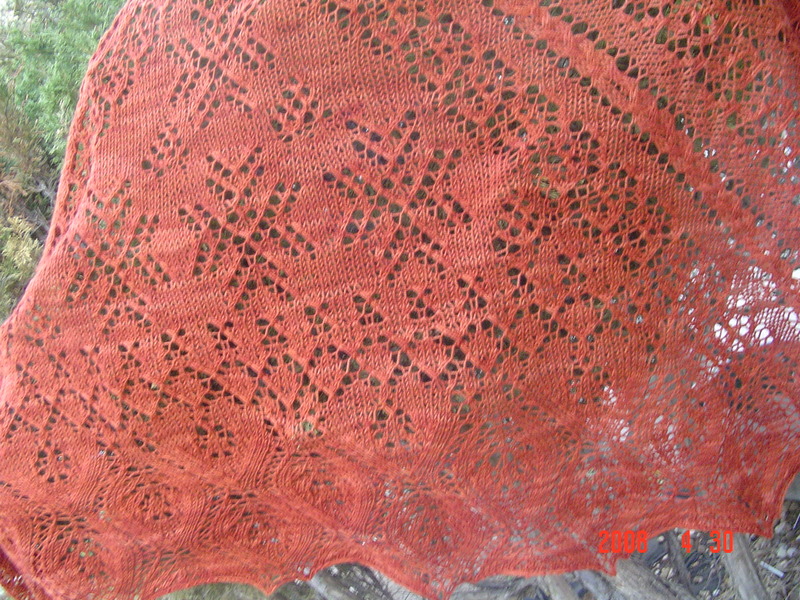 I used Shibui sock yarn in colorway Pagoda, which is a subtle variation in rust tones. 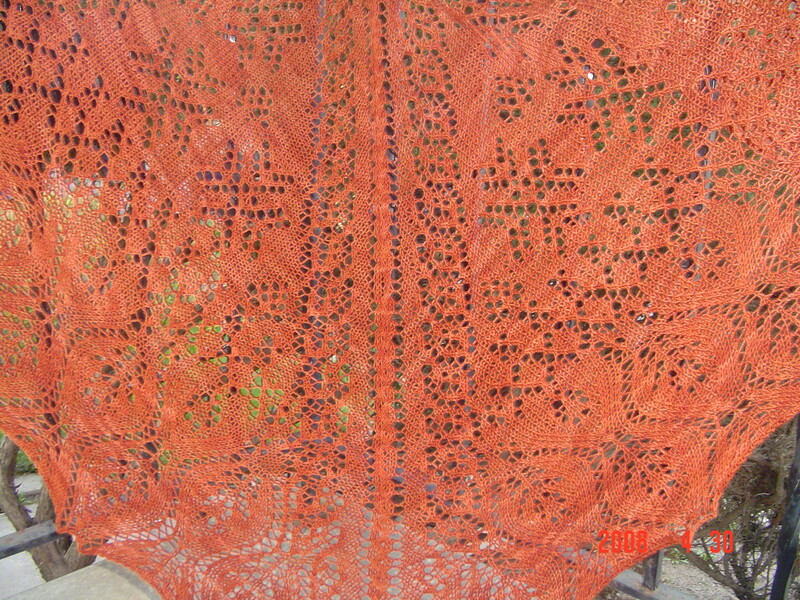 I like that it doesn’t detract from the lace pattern but gives it a bit of depth. 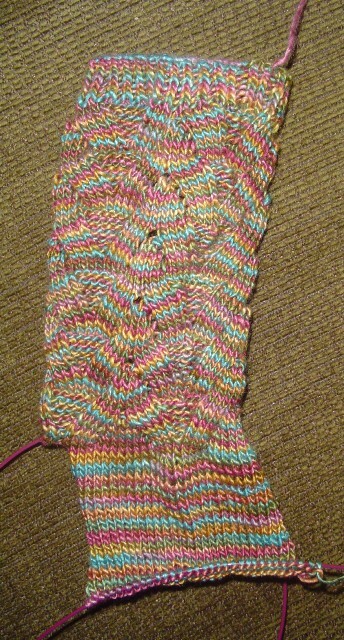 I was surprised at just how fast lace knitting can go when using sock yarn. All in all, I am one happy camper today! So J and I decided we needed some cake. We haven’t enjoyed something sweet and yummy together for a long time. I, being used to traditional cakes, decided I needed to find something that was more within the types of foods that J might eat. Basically this means a cake not requiring shortening and a cake which I could use organic sugar and whole wheat flour in. I found Lemon Olive Oil cake. It wasn’t too hard to make. I threw in some almonds for good measure, thinking they might give it some additional flavor. The recipe calls for adding sugar to the top, but I did not do so. Some of the reviews mention that it is not a very sweet cake. We found it to be flavorful and sweet enough. We may even cut out some sugar next time. The flavor of the lemon really carries it. I think that this would taste lovely with a fresh blueberry sauce. Also, some real whipped cream would be lovely. It holds up well all on its own too! A Bit of Kauni Goodness! I’ve got a full pattern of Kauni done. I love it. What surprises me the most is that it goes fast! 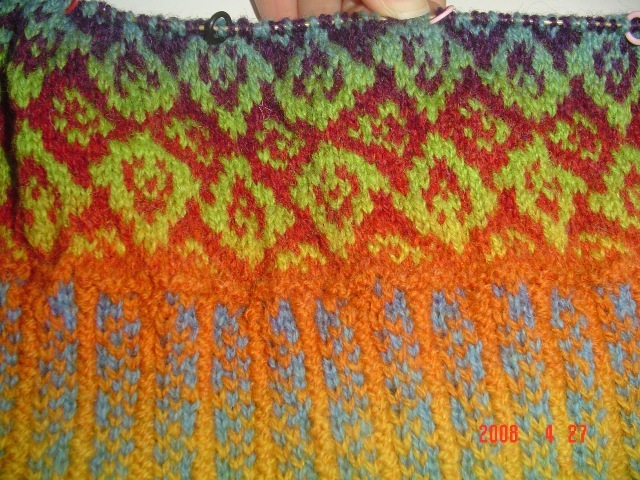 I knit as fast in colorwork as I do in knitting. So what felt like an overwhelming project is much less daunting now. Yes, I have been saying I would do it for quite some time. And now I have. It is my pleasure to present my very own etsy shop. 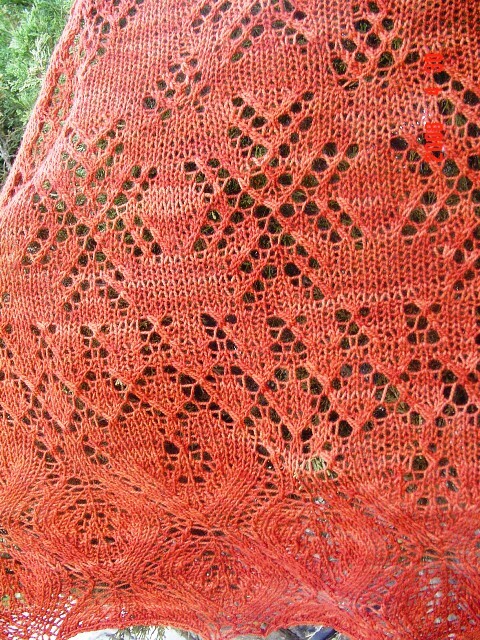 I have listed the handspun I have been working on lately, with more to come soon. If you have any questions at all, just ask! I have a little more work to do on my profile but I am up and running now. I gave my last speech yesterday, and I think I did well. What was even more fun was that I had taken my audience analysis surveys which I filled out for the other speech givers very seriously. I wrote at length why I thought gas prices would continue to climb. I asked the speech giver questions about his subject even beyond the answers I gave. I really wanted him to think and delve deep into his speech, and he did! He incorporated all that I had written on his survey. There was another guy in class who modified his speech for me, adding something in that I knew was specifically directed at me since I had made my beliefs clear in a previous speech that I gave. I caught up with him and asked him after class if he had added that statement for me, and he said that he did, though he believed similarly himself. I also learned a little about net neutrality, which I had never really heard of before. And to be honest I was quite alarmed! I went home and asked J about it, he seemed to know what was going on. If you want to know more, and this really is concerning, go here. If the ISP’s get their way, this blog will no longer exist. And for me that would be a terrible thing. So two more class periods to go and I am done with this class. I am thinking about contacting the teacher and asking if she would consider teaching argumentation and debate next semester, in which case I would gladly take her class. Let’s talk knitting for a moment. 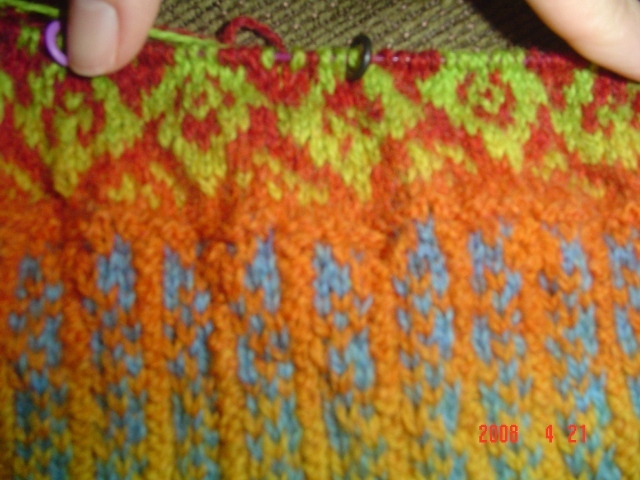 I got reinspired about my Kauni and was rocking away on it, when I noticed the yarn snagging on the knitpicks needle. I pulled the needle out and took a look, noticing that the wood was splintering. I thought perhaps I could file it down a bit with a nail file while I waited for knitpicks to send a replacement. After all, I really wanted to work on my Kauni. I filed it down a bit yesterday, but each time I filed it down it would start to catch again on another piece of wood. So I decided I would just deal with it. Last evening as I sat down to knit after class, the needle completely snapped in two at the place where it had been splintering. Now, I love my knitpicks needles, I really do! But I really am tired of them breaking for no apparent reason, or finding flaws in the needles as they are sent. I have always said that their price was right so as long as they get the new needle out to me right away, I will continue to use their needles. Unfortunately, even that isn’t happening, as there is now a high volume of customer service issues, so it takes them 2-5 days to get back to you to begin with. Once they do, they send a new needle, no questions asked, but I am wishing to work on my Kauni now! Ah well, I worked 2 rows on mystic waters and will have the final clue of mystic light coming out today, so I will be well occupied in the upcoming week. I know there was more I wanted to write about, specifically some Bug story, but for the life of me I cannot remember, I am afraid you will have to wait until my memory serves me better. I’ve been keeping this a secret so I was not able to post progress pictures. Now the secret is out, and the monkeys can be blogged. My coworker M is retiring after 38 yrs of working at our university. I am going to miss her terribly. I wanted to give her something to remember us by, something that would be my way of giving her a hug even when I was not seeing her daily. Since she frequently has mentioned black and red socks, I decided that would be the perfect gift. But plain socks would not do, they had to be a little fancy, a little fun. So I chose the Monkey pattern. I’ve gotten quite addicted to this pattern and am well into a second pair of socks, but I think that these red and black monkeys are just the coolest! 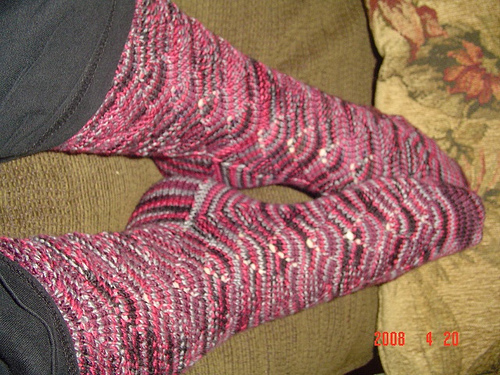 I’ve been making socks. Monkey socks. What a fun little pattern! And I’ve picked up the Kauni again, and I am loving it again too! The colors are lining up more appropriately, but I cannot be sure that will be the case all the way through. I just know I am not frogging it again!